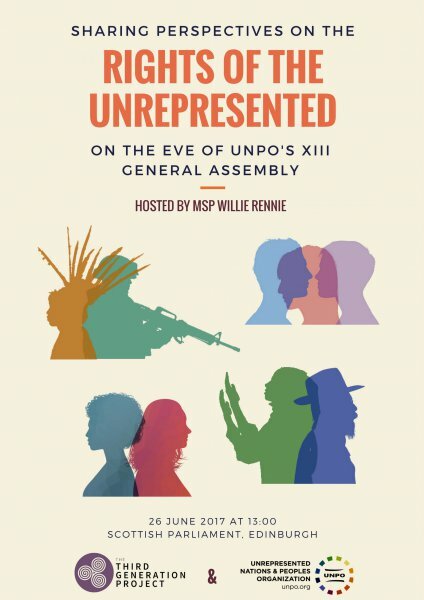 The Unrepresented Nations and Peoples Organization (UNPO), in collaboration with the Third Generation Project (TGP) and MSP Willie Rennie (Scottish Liberal Democrats), will be holding a conference entitled ‘Sharing Perspectives on the Rights of the Unrepresented on the Eve of UNPO's XIII General Assembly’. The Conference will provide an opportunity for sharing perspectives on the situation of unrepresented Nations and Peoples, with a special focus on third generation human rights. Representatives of indigenous groups and minorities, as well as academics, activists and politicians will address some of the major issues they face, stressing particularly those pertaining to identity. Members of the Scottish Parliament and of the European Parliament who are present will get a better understanding of how these communities face double discrimination according to the principle of intersectionality, particularly relevant for women, LGBT groups and refugees. The latter will be discussed in the wake of the current alarming global climate change. The event will provide an opportunity for elected officials to continue in and further develop their commitment to promoting human rights for communities who struggle against oppression. The conference will be followed by the official opening of UNPO’s XIII General Assembly. Registrations are still possible by emailing Silvia Mannino at s.mannino@unpo.org. For further information, please contact Julie Duval (j.duval@unpo.org).